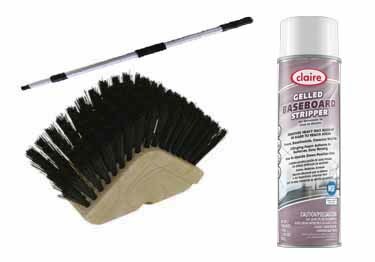 Our brush is ideal for cleaning baseboards, floor edges, or molding. Constructed from resistant, stiff poly fiber and a nonabsorbent plastic block, making the entire Baseboard Brush extremely durable, hygienic and effective. It can be used with a Threaded Aluminum extension handle that is very strong and lightweight even when extended from 33 1/2" to 60". In heavy duty situations you can add a handle with wood designed especially for janitorial grade. For best results, use the Dyn-A-Max gel baseboard stripper and cleaner. Dyn-A-Max attacks buildups on counters, displays, floor seals, and baseboards. The clinging gel works on any vertical surface without dripping. It has a soft pine odor and an inverted valve makes it very easy to use. Made of resistant, stiff poly fiber and a nonabsorbent plastic making it very durable and hygienically. The Threaded Aluminum extension handle is strong and lightweight, and conforms with foodservice standards. O-Cedar Baseboard Brush is ideal for cleaning baseboards, floor edges or molding. The triangular design is made especially for these surfaces. Made of resistant, stiff poly fiber and nonabsorbent block of foam, the Baseboard Brush is very durable, hygienic and helpful. Would not recommend, never shipped and no follow up. I had to contact the company to check on the shipment and was told it was on the way twice before they finally admitted 3 weeks later that they did not have the product. Thank you for your review. We are very sorry about this unfortunate situation. We do show we had multiple conversations/e-mails with you to let you know this item was on backorder. Typically we do not experience production delays like this. If you are still interested, we can substantially discount the product and pay for shipping if you would like. Feel free to e-mail or call us and we can send this out immediately.